Magnetic coupled DICKOW-Pumps of series NMR are of sealless design. The containment shell forms a closed system with hermetically sealed liquid end. The NMR are designed for the chemical process industry. A leak-free magnetic drive is used to improve plant and personnel safety in industrial heating plants. Magnetic driven NMR-pumps are designed to improve plant and personal safety, especially when handling toxic, explosive or other danderous liquids which react with the atmoshpere. 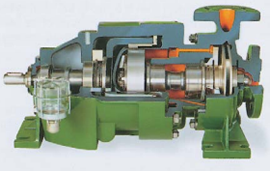 For all these services the containment shell replaces double acting mechanical seals with external fluid reservoirs and the necessary control equipment. NMR-Pumps therefore offer exceptional benefits to the chemical, petrochemical and allied industries and fullfill all environment protection rules.